After your board exams, are you on a hunt for a coaching class that gives you the necessary education and guidance for the entrance exam? Well, you have it here! 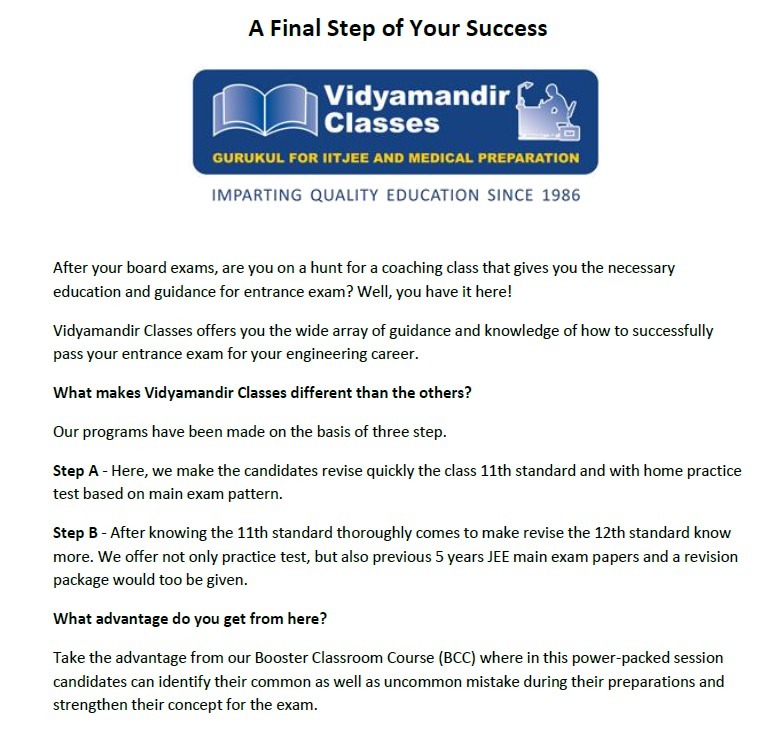 Vidyamandir Classes offers you a wide array of guidance and knowledge of how to successfully pass your entrance exam for your engineering career. What makes Vidyamandir Classes different than the others? Our programs have been made on the basis of three steps. Step A - Here, we make the candidates revise quickly the class 11th standard and with home practice test based on the main exam pattern. Step B - After knowing the 11th standard thoroughly comes to make revise the 12th standard know more. We offer not only practice test, but also previous 5 years JEE main exam papers and a revision package would too be given. What advantage do you get from here? Take the advantage from our Booster Classroom Course (BCC) where in this power-packed session candidates can identify their common as well as an uncommon mistake during their preparations and strengthen their concept for the exam.